Implemented by the Coastal Plain Conservancy and funded by Sasol through the Community Foundation of Southwest Louisiana, the Longleaf Legacy Project is dedicated to the heritage, restoration and rebirth of the longleaf pine forest – an endangered and historically significant ecosystem. Project partners are engaged in a multi-year effort to restore the local ecosystem to its former majestic condition. The project began in 2016 and encompasses restoration efforts of more than 70 acres of longleaf pine habitat. Southern longleaf pine forests are among the world’s most biologically diverse systems, home to some 300 species of birds and 2,500 species of plants. Longleaf pine habitats also play a vital role in maintaining the long-term health of the region’s rivers, aquifers and freshwater springs. Habitat restoration projects are essential to stabilizing declining wildlife populations and maintaining healthy ecosystems. Project partners are implementing management practices within the longleaf forests inside Sam Houston Jones State Park to restore degraded longleaf pine areas to their former majestic conditions and to reduce wildfire hazards. Visit the Sam Houston Jones State Park website. The longleaf pine was once one of the most abundant tree species in the United States. Its realm – vast savannas shaped by thousands of years of frequent fires set by lightning and Native Americans – stretched some 90 million acres (roughly the size of the state of California) across the American South from Virginia to Texas. As America grew, pressure on the longleaf pine ecosystem grew as well. Most mature trees had been harvested for timber by the early 20th century. Land use practices such as logging, farming, development, urban encroachment and fire exclusion have reduced the longleaf pine habitat remain to less than four million acres, making it one of the most endangered ecosystems in North America. The Longleaf Legacy Project aims to preserve the iconic tree’s rich history, restore the splendor of local forests, and ensure the resiliency of habitats therein for generations to come. 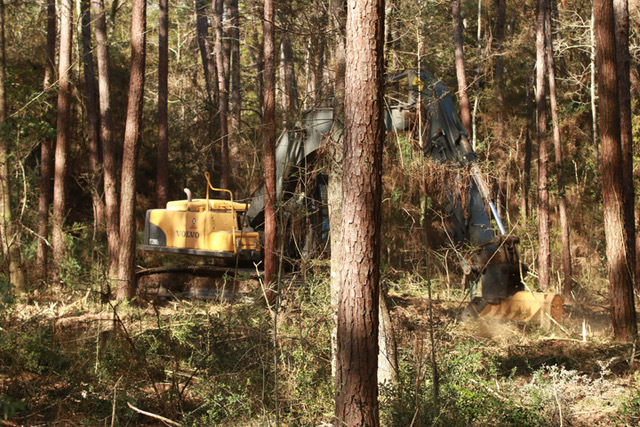 Phased work to restore the longleaf pine habitat is currently underway in the park. Mulching: To restore this ecosystem, a mechanical mulcher will be used to remove the woody plants that are not natural to this environment. Although this may look destructive, mulching will help remove the plants that don’t belong and make room for the plants that do belong. Burning: A prescribed burn will release the nutrients from the mulched material and pine straw back into the ground to serve as fertilizer for the grasses and wildflowers that will grow there. By regularly (every 2-3 years) burning this area, dangers of a wildfire will be greatly reduced, and brush growth will be controlled in the future. Growth: The new vegetation that grows following prescribed burns will be what grew in this area historically and what the local wildlife are best adapted to. Sam Houston Jones State Park has completed mulching in the first phase area of the park in preparation for the first controlled burn. The mulched brush and groundcover will be burned later this year. 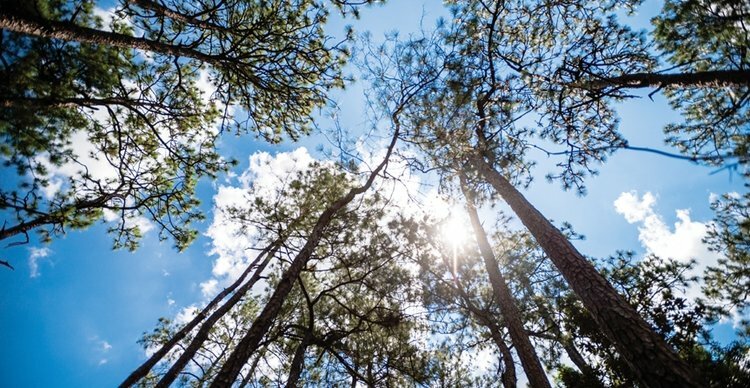 The goal of the Longleaf Legacy Project is the restoration and rebirth of the invaluable longleaf pine ecosystem in Sam Houston Jones State Park. Once mulching and controlled burning are complete, native species of wildflowers, grasses, birds and small animals will return and restore the longleaf pine ecosystem. The longleaf pines are often called “wonder trees” because of their heartiness and versatility. Longleafs are the most beetle infestation-resistant southern pine tree species. They can thrive during wet or dry periods, withstand hurricane force winds and tolerate fires, provide a great habitat for wildlife and are well-suited to changing climates. They are impressive trees. Longleaf pines are important trees for lumber and wood products: The species produces tall, straight trunks that are valuable for power poles and pilings. Longleaf pitch was used in the past for sealing wood boats and ships. There are large tracts of land the Louisiana longleaf areas are still owned by “Naval Stores” companies. Naval stores are products derived from pine sap, which are used to manufacture soap, paint, varnish, shoe polish, lubricants, linoleum and roofing materials. Longleafs were tapped in the past to collect turpentine for many uses. Longleaf pine straw is currently used in the landscaping industry as mulch. Pine needles are commonly used as pine straw mulch, which is gaining popularity for the benefits over traditional bark mulch. The following lessons are downloadable and designed for use as a free educational tool for elementary students in grades 3-5. This material is intended to engage students on both the natural and cultural history of the longleaf pine ecosystem and the Longleaf Legacy Project underway in Louisiana’s Sam Houston Jones State Park. Begin your journey through the longleaf pine ecosystem. Follow the links below to lesson plans on the project and the ecosystem. LESSON 6. Restoration: What will restoration look like? Visit Sam Houston Jones State Park to see our progress! The park is located at 107 Sutherland Road in Lake Charles. Visit the park online at the Louisiana State Parks website. Proud partners on this effort include Sasol, the Louisiana Department of Culture, Recreation and Tourism, the Coastal Plain Conservancy, the Community Foundation of SWLA and Patagonia. Together, project partners aim to help restore the longleaf pine habitat in Sam Houston Jones State Park in Lake Charles, Louisiana.